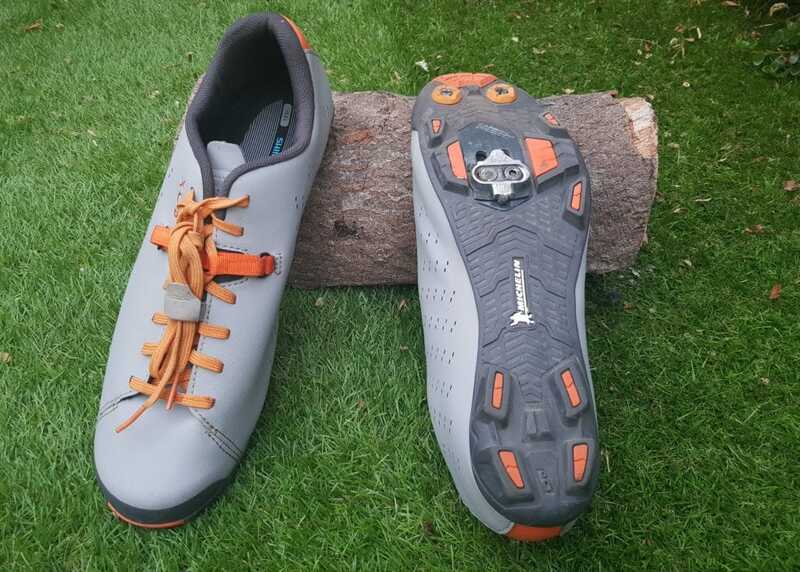 Shimano XC5 SPD Shoe - ADVNTR. Lace up shoes are once again de rigeur. Ironically, it is the old skool types who look at them with dismay and not a little amusement. Despite this, the trend is gaining momentum and many major brands are jumping on the bandwagon. So what do we think of the Shimano XC5? 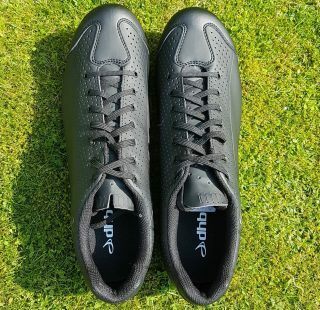 Like the DHB Dorica we reviewed earlier in the year, it is pitched as a mid-range mountain bike shoe. 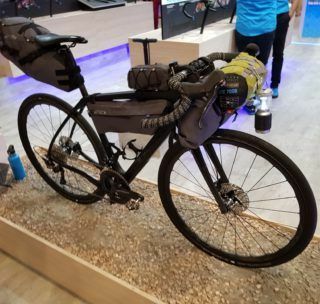 It also has a number of features that make it just as suitable for adventure cycling. 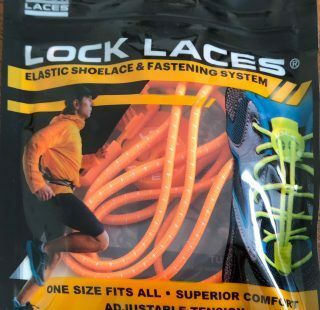 Obviously the stand out feature of these shoes are the laces. Compared to the full Shimano (shoe) line-up which is awash with BOA-style dials, ratchets and Velcro straps, they look as out of place as a penny farthing at the Tour de France. The grey and orange colour scheme is somewhat eye catching too! For those worried about tangling their laces in the drivetrain, Shimano have included an elasticated ‘lace tidy’. Another useful feature is the Power Strap that lets you the ability to adjust the tension across two sections of the shoe. The uppers are made of perforated synthetic leather. It doesn’t feel remotely like leather to touch and is very plasticy. On the bright side, it wipes clean incredibly easily and appears to be pretty durable too. The rear of the shoes feature a fully reflective heel cup design which is a neat touch. 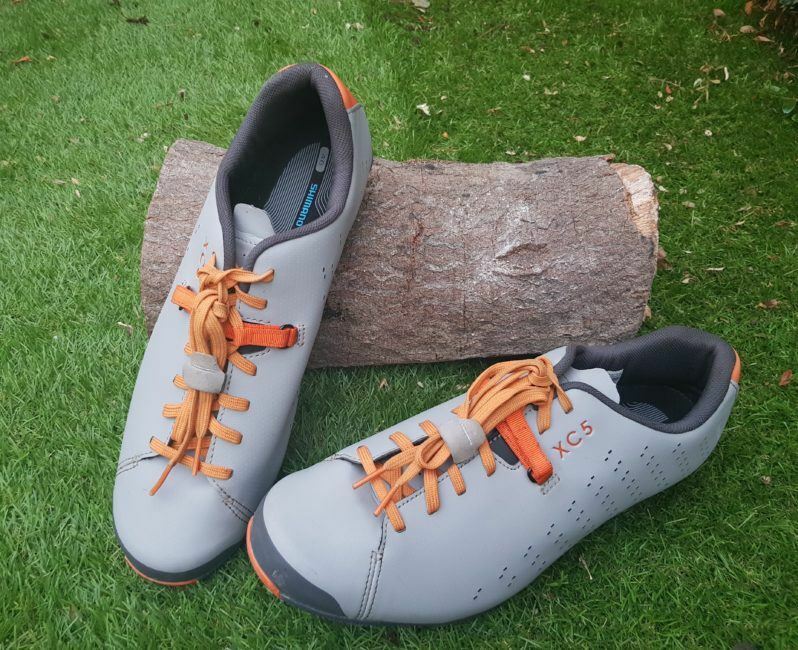 We think it makes the shoes an ideal choice for commuting and riding in low light conditions on the road. Flipping the shoes over you’ll spot the Michelin branded grippy rubber outsole. Beneath this is a carbon reinforced midsole for added stiffness. Toe stud mounting points are present, but no studs are included. There is a spare pair of black laces though, just in case you find the orange a little too bright. Accepted wisdom is to ‘size up’ when buying Shimano shoes. I take a UK 10.5. 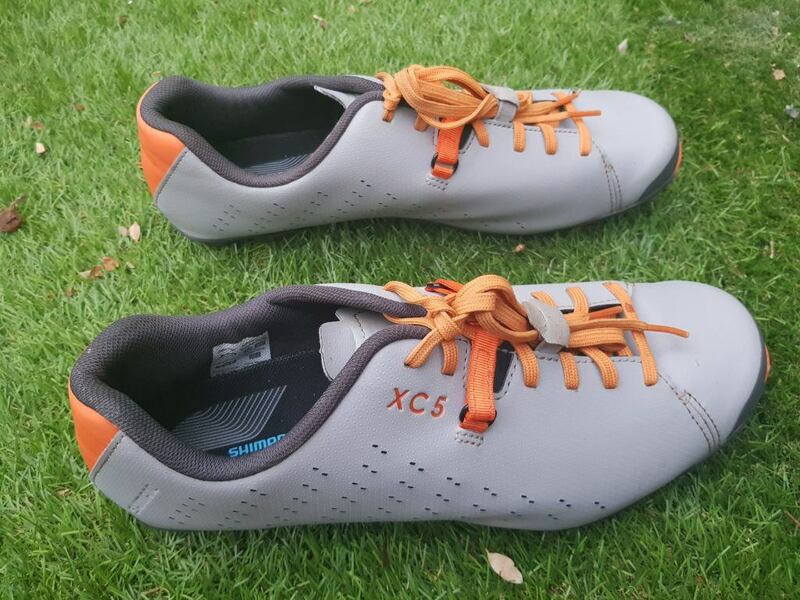 The XC5 test pair are 46 and fit perfectly. The toe box is pretty wide and allows plenty of wriggle room. The last narrows towards the rear of the shoe. Meanwhile, the heel cup is well padded and hugs your ankle reassuringly. 800+ miles on (probably because the uppers are plastic) and they haven’t stretched or shrunk and still fit like a comfy pair of slippers. Jumping from a very racy (uber stiff) pair of Lake MX237 MTB shoes to the XC5, it felt as if I was wearing flip-flops. 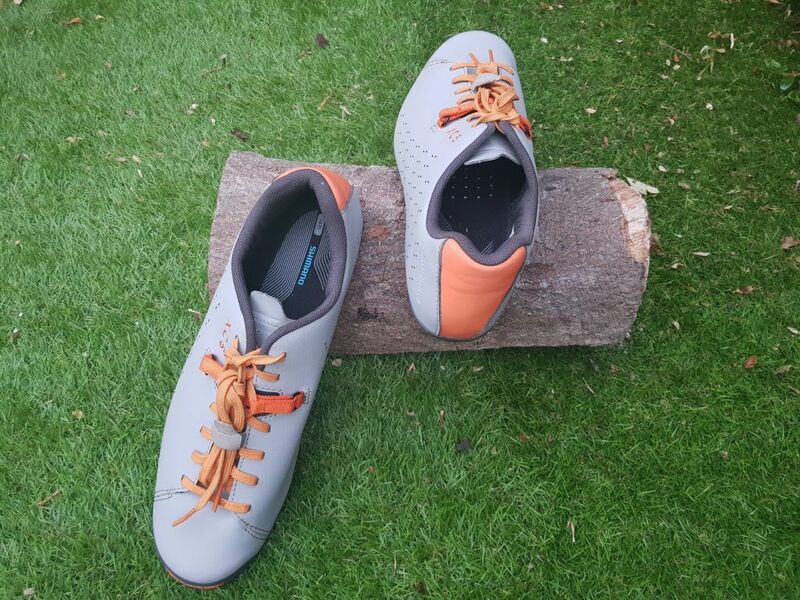 Although the soles feature carbon reinforcement, they do not compare to a genuine full carbon sole. 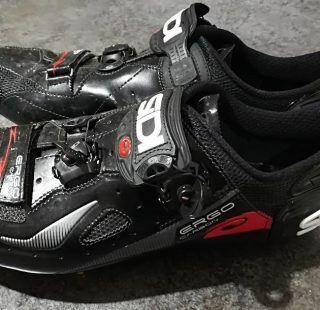 You will feel the shoes flexing when putting real effort into the pedals. Unless you require nothing but direct power transfer, a little flex isn’t such a bad thing. It is particularly nice on a long ride, when unyielding carbon can become uncomfortable. If you are looking for a race shoe or are obsessed with Strava trophies, you’ll need to dig deeper into your pockets and look elsewhere. Rear section of the shoe is reflective which is great for riding in low light. The lace tidy does a decent job of keeping those unruly laces under control, although there were a few times when they managed to escape. Threading them through the lace tidy and then looping under a tensioned section of lace prevented any further issues. On any long gravel ride or tour, you will inevitably have to jump off the bike and walk sometimes. The Shimano XC5 is way better for walking than a race shoe – helped considerably those flexy soles. The Michelin rubber outer soles are also very grippy. As they stand proud of the cleat, they are protected from unwanted wear and tear. There is one slight downside to this in that it can be a little harder to fully ‘lock home’ cleat and pedal when you do clip back in. The plastic ‘elephant hide’ uppers looked like they’d be a real sweatfest in the heat. They are so well perforated though, that this wasn’t an issue. ‘The uppers wipe clean incredibly well which is always a plus point come the winter months. The orange laces are already discoloured and collect a lot of dirt and debris. 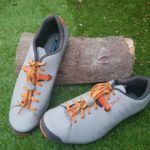 The laces will turn as many people off of these shoes as it will attract buyers. Styling aside, at less than £120 (less than £100 if you shop around) the Shimano XC5 offers excellent value and a great balance between comfort and performance ideal for adventure cycling. Laces do escape and will try to mate with your drivetrain!